Historically, Trinidad and Tobago and Jamaica have not shared the unity that Caribbean people should aspire to. In fact, both countries have engaged in petty rivalries which have served to do little more than divide their people further. 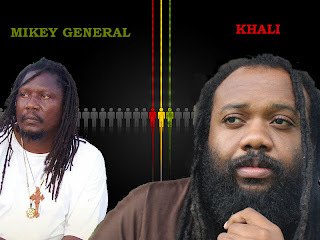 The recent musical collaboration between two of the countries’ reggae singers, Mikey General (Michael Taylor) of Jamaica and Khali (Khalfani Taylor) of Trinidad, however, serves as an example of the love and unity between the two Caribbean nations. Brought together by their shared Rastafarian faith, both Taylor Bwoys have united their vocals on a revived version of the Rastafarian anthem, 1997 Exterminator hit, Ms. Taylor Bwoy. Given their shared surname and their shared experience in finding Rastafari, the track was an obvious choice for the collaboration. Produced by Good Vibes Entertainment, a newly founded production house which is also the result of the collaboration between both Taylor Bwoys, the song is a true representation of the greatness that is known as Jamaica’s reggae music history. Recorded and mixed by Anthony ‘Al’ Graham at the island’s famous Cell Block Studio, the single boasts of an all star musical cast, Kirk ‘Kirkledove’ Bennett on the drums, Donald ‘Bassy” Dennis on the bass and guitar and Paul ‘Wrong Move’ Crossdaleon the keyboard. Mastering work was done at the one and only Tuff Gong Studio by Mastering Engineer Gary Sutherland. Vocally the track is led by the Taylor Bwoys, but top vocal performer Paul ‘Lymie’ Murray also lends his talent to the single in a most melodic and harmonic manner. A video for the song is currently in production. When asked about the purpose of the collaboration, both Taylor Bwoys agree that it was within the fulfilment of their divine purpose. “Give thanks to Jah for these moments that I will cherish for eternity.” Those were the words of Khali Taylor when asked how he felt about the project, whilst his Jamaican counterpart, Mikey, can be quoted as saying, “I am very pleased with the quality of work, and Give thanks to Jah for sending the brother my way”. So it seems that similarly to the smash hit original version which was released in 1997, the remake promises to follow the same path, the path of success. Already a hit within the Rastafarian Nation on the island, it seems only a matter of time till the song spreads to the streets, the dancehalls and the rest of the Caribbean on a massive scale. The Taylors are hoping that the project will serve as an example of the Love of Rastafari and the Strength of Unity. An example that they hope their respective nations will take heed of and observe, but just as it is in every other story, we will have to wait for time to tell it.